Feast your eyes on the LEGO Movie 2 Rexcelsior spaceship set – AiPT! Possibly one of the coolest things to come out of the LEGO Movie (and the subsequent sequel out February 8th) is the creativity of the characters. The movies point out you don’t have to build what is on the box, but instead go ham and get creative. Today LEGO revealed quite a creative new ship from the upcoming film. Called The Rexcelsior this 1,826 piece set features two minifigures, five microbuilds, and a ship that is 8 inches wide, and 15 inches long. It’s a big one! Out May 1, 2019, check out all the details below. All aboard for LEGO® space adventures with Stubble Trouble Emmet and Rex Dangervest on The Rexcelsior! THE LEGO MOVIE 2™ character Emmet has drawn stubble on his face to be more like his vest-friend. But will he enjoy travelling in Rex’s super-awesome sci-fi spaceship? Join Rex in the cockpit or hang out with the LEGO raptors. There’s loads to discover with this awesome LEGO set and spaceship from THE LEGO MOVIE 2–just make sure you are ready for enemy attacks. Reload the 6-missile spring-loaded shooter and fire! – This kids’ toy LEGO® set includes 2 minifigures: Stubble Trouble Emmet and Rex Dangervest, plus Emmet and Rex microfigures and 5 micro raptor dinosaur toy figures (3 metallic, 2 dark blue). 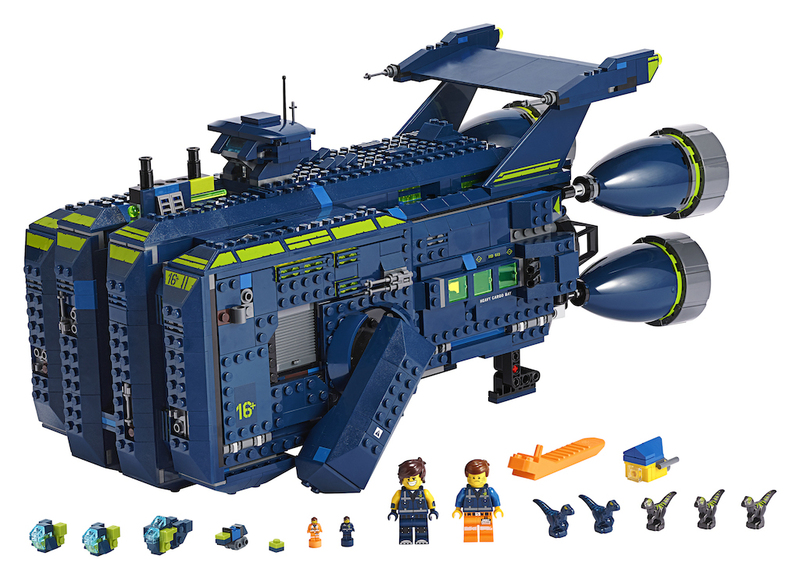 – The Rexcelsior spaceship toy features big boosters, dual microfigure cockpit, detailed microscale interior with various rooms and compartments, opening doors and lift-off roofs for easy play, handle with a trigger to activate the rapid-fire, 6-missile spring-loaded shooter, and an ammo storage compartment with 6 extra missiles. – This building toy for kids also includes 5 micro builds: Emmet’s house, a forklift, 2 interaptors and a dropship. – Kids can recreate stellar action from THE LEGO® MOVIE 2™ with this creative toy playset. – The Rexcelsior LEGO® spaceship toy measures over 7″ (19cm) high, 15″ (40cm) long and 8″ (21cm) wide.